It is Foodbuzz 24, 24, 24 again and I have a meal prepared for you cooked solely for Greek wines with an Appelation of Origin, or OPAP in Greek. OPAP (Onomasia Proelefseos Anoteras Piotitos) literally means ‘Appellation of Origin of Superior Quality’ and is equivalent to the French V.L.Q.P.R.D. However, I have used the French term Appellation d’origine contrôlée (AOC) in my title, as it also refers to products other than wine, exactly like the Greek OPAP. I am just a wine enthousiast, no expert, but I think it is common sense that if Greece wants to conquer the international wine market, the only way to do so is with local varieties and not with Chardonnay! Therfore, I decided to present to my readers with a small selection of Greek OPAP wines, with as the centre of the meal and not the other way round. So, I chose the food for the wine rather than the wine for the food. I paired each wine with a product or recipe from the area where the wine is produced, following basically rule no. 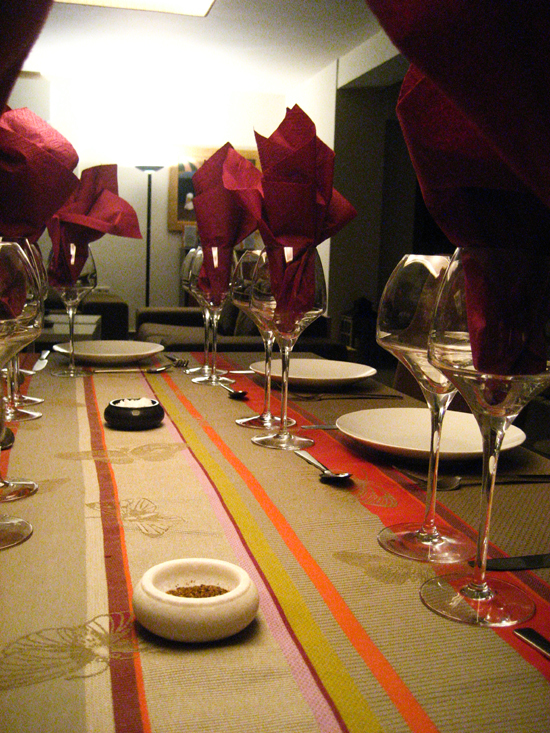 1 of pairing food with wine: just go with the local cuisine and you’ ll probably get a good match! Don’t feel embarassed if you know nothing about wine produced in Greece. I bet you that 99.9% of non-Greeks will have nothing to say on the subject (and many Greeks too). The other 0.01% will say “retsina” referring to the white wine flavoured with pine resin, which was the commonest house wine of tavernas back in the 70’s. It was so vile, that Greek wine was stigmatised for years. However, this did not hinder some pioneering wine-producers to try and vinify local and international varieties in a consistent, proper way, and today, about 25 years later, Greek wine has started to attract the attention of media outside the country with wines appearing in the “Best 100 wine” lists of internationally acclaimed wine magazines and winning prestigious medals in international wine challenges. In setting up the menu and since I am a city person, I had to resort to some expert advice. And that is none other than Diane Kochila’s book The Glorious Foods of Greece, a treatise on local recipes from all over the country. I got some good ideas from there, which I modified to suit the wines. We had a great time at the dinner. It was nice to introduce my friends to the concepts of pairing wine with food and to give them the opportunity to think about the importance of local grape varieties and recipes. However, what I would really like to come out of this post is to see people outside of Greece start appreciating Greek wines. So, I urge you to track down some good Greek wine bottles and I promise that you will be pleasantly surprised! Zitsa is an area in northwestern Greece and was given the AOC appellation in 1973. The local grape debina is white and produces fragrant wines, either still or sparkling. 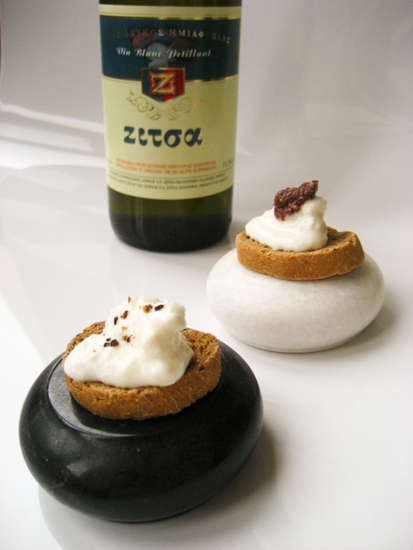 In general Zitsa is a rather less known appelation and one cannot find the wines very easily. I managed to track this down at my local supermarket, but not in a couple of wine shops in my area. It is made by the local wine co-operation and is semi-sweet with very fine bubbles, a delicate fruity aroma on the nose, nice fruit on the palate and good acidity despite the existence of sugars. It was perfect as an aperitif wine and really paired well with the fresh goat’s cheese crostini. I read in Kochyla that galotiri, which literally translates as “milk cheese”, is a naturally fermented cheese (made without rennet) and is produced in Epirus, Thessaly and Roumeli. Santorini, or Thira, is one of the most stunning places in the world. A tiny volcanic island smack in the middle of the Aegean sea, produces by far the best white terroir wines in Greece. The main grape variety here is the white Assyrtico, which according to the law can be mixed with another two white varieties, Aidani and Athiri. The volcanic soil, lack of irrigation and a particular way of planting the vines (they are coiled like bird’s nests), gives highly acidic and alcoholic wines with citrus notes and an interesting minerality. They can age beautifully if kept correctly for 10 years or more. Santorini also produces some really good sweet wine, called Vinsanto, made from grapes that have been left to dry in the sun. Domaine Sigalas is a relatively new winery (founded in 1991). Last year his unoaked Santorini was voted one of the Best 100 wines by Wine Specator. This year it was his oaked Santorini which made it to the Best 100 of Wine and Spirits. The vineyards are composed of volcanic ash and sand and the vines are more than 50 years old. I chose the unoaked version for the meal as I think that it represents the terroir much better. The wine has a beautiful citrus nose, a full body, with mineral and citrus notes on the palate and a lasting finish. 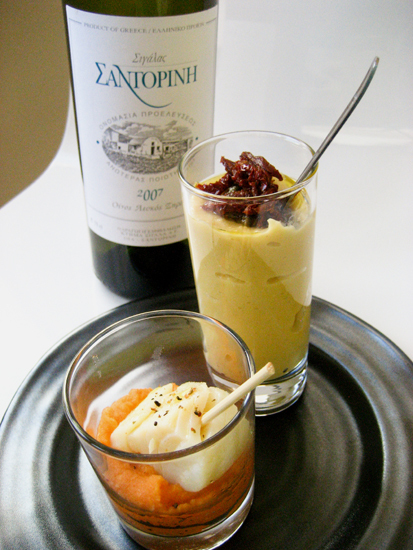 I decided to pair the Santorini Sigalas with two traditional local recipes. One is the brandada (I know, it sounds very much like brandade): a lightly poached salt cod fillet served with a tomato aioli (or skordalia in Greek). The second one is split pea puree or fava in Greek, which is “married” as the locals say with capers and sun-dried tomatoes. The combination worked really well. Both dishes complimented the wine flavours and fortunately I had made loads of the fava puree, because there were many refills! Soak the cod fillet in cold water at least 36 hours before you need it. Change the water frequently (about 5-6 times). When the fillet is ready, skin it and remove any bones if there are any. Cut into large chunks and poach in a bit of olive oil, very gently because the flesh will separate. Leave fish aside. Add the tomato paste into the same pan and let is simmer for a little while. Add water or oil if necessary. In a small saucepan bring some water to the boil and add the garlic. After two three minutes throw away the water and fill the saucepan with fresh. Boil the cloves of garlic until tender. This way you get the flavour but not any of the side effects of garlic (bad breath, indigestion etc.). Boil the potatoes skin on until tender. Peel them carefully while hot and mash them together with the garlic and some olive oil until you get a nice homogenous mix. Stir in 1 tsp of vinegar and the tomato and season well. To serve: place a tbsp of the aioli on a plate or verrine and top with the fish. Finish with some good olive oil and freshly ground black pepper. Rinse the split peas a couple of times. Fill a large pan with enough water to cover the peas and bring to the boil. Remove the scum and add 1 chopped onion , 2 tbsp of olive oil and some salt. Simmer for 1-1.5 hrs until the peas have softened and turned into mush. Be careful not to let them dry, so do add a little water from time to time, otherwise they will stick to the bottom of the pan. When they are ready process in a blender together with some lemon and olive oil until you get a homogenous mix. Season well. The consistency should be reminiscent of mashed potatoes, perhaps slightly more runny. I also pass then through a fine sieve to get a velvet texture. To serve: place the fava in a bowl or large plate and top with the capers and sun-dried tomatoes. Drizzle with olive oil and some more lemon juice. You can eat fava either cold or hot. Naoussa is a pretty town of Northern Greece and also an AOC Appelation. The grape variety here is the red xinomavro grape (which literally translates as “sour black”) that gives red wines of medium body with medium to high acidity and a typical nose of red fruits and tomato. 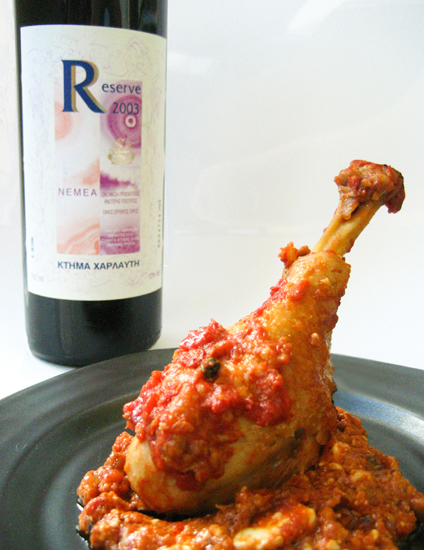 It is one of the two main red grape varieties in Greece and many consider it the most important. Domaine Fountis is a very small producer, who believes in the local xinomavro grape and has been making some really typical wines. His wine, Naoussaia (which means the lady of Naoussa) is a very good example of xinomavro with a seductive nose of red fruit, medium body, nice acidity and well-integrated tannins. It comes from one of the best areas of Naoussa, Ramnista, and was produced in only 8.700 bottles. In general xinomavro needs food to be appreciated otherwise the high acidity will be rather hostile for most palates. It also needs a bit of bottle aging before it is consumed, so the 2003 vintage was perfect for the occasion. Xinomavro pairs beautifully with lamb, but since I had decided to cook a bird for the dinner (to keep up with the thanksgiving theme), I could not serve two types of meat! 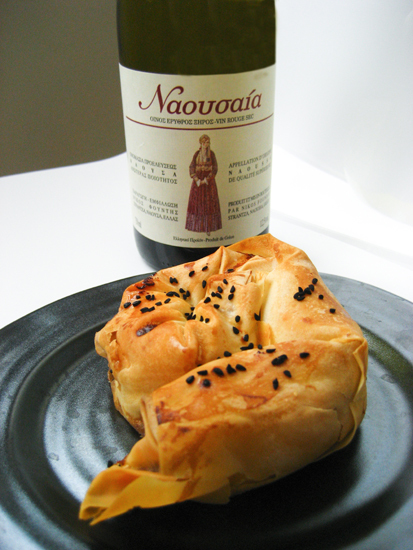 I therefore went for a traditional pie filled with onions and walnuts, but I added red bell peppers as I thought that it would complement the wine better. The combination was mind-blowing. Even a couple of my friends who don’t like xinomavro really enjoyed it, which clearly demonstrates that it is a pity that some wines are drank without food. Heat 3-4 tbsp in a large pot and sauté the onions until tender, about 15 minutes. Try not to give them any colour. Towards the end of the cooking time add the bell peppers. Stir in the chilli, walnuts and season well. Spread a phyllo sheet on your work surface and fold in half. If your phyllo is tοo thin you can use two sheets. Brush each sheet with oil and spread 2-3 tbsp of the filling in the middle. Be careful not to fill the pies too much because they will break during baking. Fold up the sides and the roll up the phyllo to make a cylinder. Brush with oil and then coil it carefully. Place it on a baking sheet lined with parchment. Repeat with the rest of the phyllo and filling. Brush the pies with some milk or egg white and sprinkle with sesame seeds. Bake for about 40 minutes until phyllo is golden-brown and crispy. Nemea is a small town in the Peloponnese and a famous archaeological site and also the biggest AOC vineyard in Greece. The local grape is the red agiorgitico (Saint George) grape, which should participate in the wine 100% in order to get the appellation certificate of Nemea. The agiorgitico grape is probably my favourite Greek red variety. It produces reds of good body, plenty of red fruit (mainly red cherry) and balanced acidity and tannins and can easily be enjoyed on its own. However, that doesn’t mean that it lacks complexity or character and when vinified correctly it produces great wines capable of at least 10-15 years of aging. Domaine Harlaftis is located in Drossia, Attica and is one of the oldest domaines in Greece. The land in Nemea was bought in 1997 and the vineyard where this agiorgitiko comes from is cultivated organically. The wine has spent two years in the barrel and one in the bottle (hence the name Reserve on the label) resulting in a very clean nose of red cherry, raspberry, spice, vanilla and roast nuts and some earthy undertones, a full body, nice, round tannins and a lingering finish. It is only vinified in good vintages (they skipped the 2004 vintage for example), which is rather a rare practice in Greece. I paired this wine with a traditional Peloponnesian recipe from the area of Laconia, with the unpronounceable name of Barthouniotiko. It is a rooster braised in tomato sauce and finished with feta cheese. I had to reduce the feta cheese of the original recipe, so as to not overpower the wine and I also added a mix of peppers to give the dish some spice. I was really worried about this combination, because fine wines sometimes are hard to pair with rustic dishes. However, it worked really well and was a great hit with everyone. Sprinkle rooster with salt and vinegar and set aside to marinate for 30 minutes. I only kept the skin on the drumsticks so that the dish will not become very heavy. Pat the pieces dry and brown them in a bit of olive oil. Add the tomatoes, tomato paste, bay leaf and chopped onions and simmer everything very gently until the meat is tender and falling off the bone, about 2.5 hours. Remove the meat from the sauce, add the feta cheese and peppers to the sauce and let it simmer for a couple of minutes. Return the meat to the sauce and serve with pasta or some bulgur wheat. Mavrodaphne is the appellation grape of Patras (sweet wines are OPE and not OPAP, but it is mainly the same thing) and probably the second most abused type of wine after retsina, as its mass production up until recently gave it a bad name. Mavrodaphne is a red grape and is mainly vinified as a sweet dessert wine, although recently it has started to appear as a dry style also. Thannassis Parparousis saw the potential of the grape and with careful vinification produced a sweet dessert wine of very high quality which has aged for two years in the barrel and one in the bottle. The 2003 Reserve is a beautiful wine with red fruit, damson chocolate and walnut on the nose, balanced sweetness and a full body. Preheat the oven to 170 oC. Pour the olive oil in a bowl and gently whisk in the eggs, cream, milk and sugar. Fold in the flour, baking powder and cinnamon and finally stir in the walnuts. Pour the mix into a prepared cake tin and bake for 45 minutes. Let the cake cool before covering it with the chocolate ganache. For the ganache: heat the cream to 90oC (either in a pan or in the microwave) remove form heat and add the chopped chocolate. Wait for 1 minute and then either stir with a wooden spoon or with an immersion blender until you get a nice thick cream. Carefully pour over the cake. You can keep any left over ganache in the fridge for at least a week. To use again just reheat gently in bain marie. What a spectacular post! I learned so much and will be seeking out some Greek wines at the store immediately. And that cake sounds divine. Brava! Looks like another wonderful evening hosted by Ioanna. I too am paying more attention to Greek wines and studying their food matches…you’ve done a wonderful job here, congrats! Wow, that braised rooster looks scrumptous! I’ll be adding this post to the 24, 24, 24 roundup I’m doing on my blog tomorrow! you are right – most people do not know much about greek wines, as a recent study conducted by the institute where i work discovered. tourists say they are interested in finding out about such products, but there is little information available on the topic. we make our own wine, but admittedly home brew cannot be compared to bottled wine – it is a completely different thing. 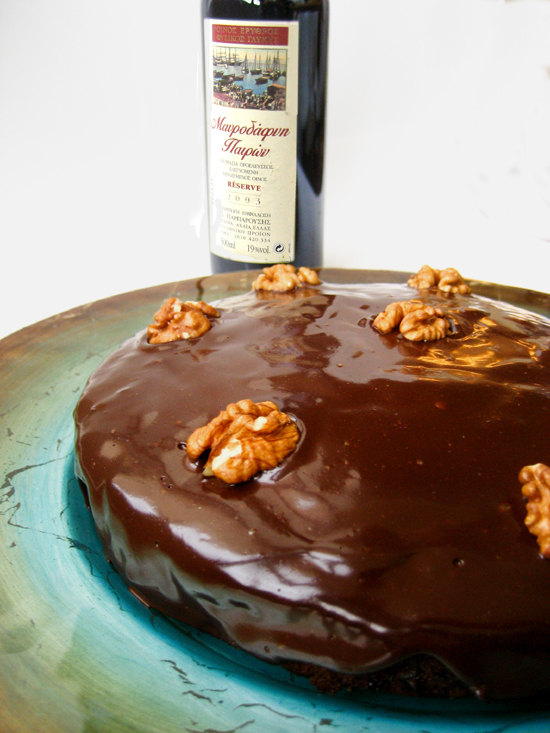 the idea of drinking wine with a cake still seems a little strange to me – i am just fine with one or the other at the end of such a banquet! An absolutely wonderful and informative post Ioanna! Very educational and it was great to see the food pairings. That walnut, onion and red pepper pie is a winner! You’ve done such a great job of pairing food and wine – and the meal looks spectacular. The platforms for your opening course are creative AND appealing. Your guest were very lucky! Beautiful! Yes, Greece is the Last Undiscovered Country of the European Culinary Arts, and Greek Wines are ferments the forgotten, original cellar. Good for you! I will vote for this entry. Though, I should mention you gave spelled Diane Kochilas’ name wrong in the “Onion, red pepper and walnut pie” recipe above. Thank you all, I wil be very happy if this post really makes a few people slightly more interested in Greek wines. Sam, I have corrected Diane Kochilas’ name, but in Greek it is spelled Κοχυλα, so it is easy to get mixed up. Plus, I am sure it won’t be the only mistake of the post! Johanna… I’m speechless!!!!!!! What a FANTASTIC post!!!!!!! Congratulations on being one of the 24, you deserve it soooooooo! No idea on the wines but I love the idea of marinating food/wine. This is something so in fashion here in Spain! All the food looks so profesional and sinful… girl… you have outdone yourself with this post…. BRAVO!!!!!!! one reason i dont drop here often is .. i just miss home.. I now most of the wines you used here and what fantastic choice of menu. I always love Kochlias books and her writings…. What a beautiful entry! Your dishes look amazing and the concept was a wonderful idea. Thanks for the lesson on Greek wine! Your pairings sound fantastic! Καλή μου, ανακάλυψα πρόσφατα το site σου κι έχω πραγματικά εντυπωσιαστεί! Οι συνταγές σου είναι εξαιρετικές, και όλα τα θέματα που πρόλαβα να κοιτάξω. Θα εντρυφήσω περισσότερο, και θα τιμήσω σίγουρα και αρκετές συνταγές! Tο πιο ωραιο σου ποστ Ιωαννα. Οχι μονο προωθεις τα ελληνικα κρασια αλλα τα και τα φαγητα που ετοιμασες για να τα αναδειξεις ειναι εκπληκτικα. ΑΨΟΓΗ Ιωαννα. Σημερα με κανεις να θελω να φωναξω ποσο χαιρομαι που σε γνωρισα στην μπλογκογειτονια. Δεν θα μπορουσες να σκεφτεις κατι καλυτερο σα προοιμιο των εορτων! Οτι αλλο να πω απο δω και περα θα ειναι .. επιφωνημα οποτε παω να τυπωσω την αναρτηση!! As always – beautifully done. I’d LOVE some of that pie and wine!